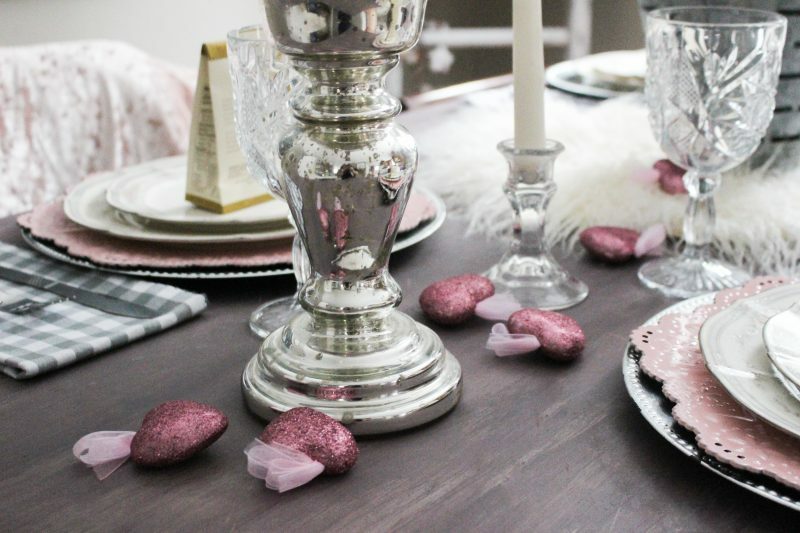 Set a pretty Valentine’s Day tablescape with a pink and silver color scheme, plus lots of texture that is perfect for a romantic dinner at home. Hello and welcome to Our Crafty Mom! I’m so happy to be participating in another fun tablescape blog hop hosted by my friend Chloe from Celebrate and Decorate. The fun started on Monday with A casa di Bianca so be sure to start at the beginning of the hop so you don’t miss any of the lovely Valentine’s Day table inspiration! For my tablescape, I decided to challenge myself to use all items that I already had. It is probably because I binged the Netflix series, Tidying Up With Marie Kondo. If you haven’t watched it yet, I highly recommend it. First of all, Marie Kondo is just adorable. You seriously just want to invite her over and give her a hug. She has such a comforting way about her. The show is based on her best-selling book The Life-Changing Magic Of Tidying Up. There is a lot to it, but the basic concept is decluttering your home and only keeping things that spark joy. Since I love thrifting, I have lots of pretty dishes and knew I could put a pretty tablescape together with what I already owned. Let me show you what I used. The soft colors are perfect for a romantic Valentine’s Day dinner! Now that I had the place settings together, it was time to choose a centerpiece. 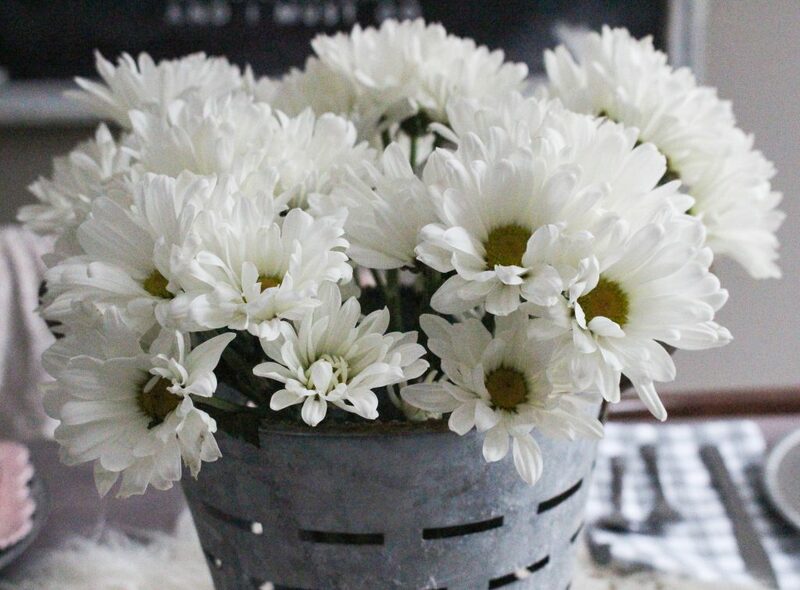 While I was shopping at the grocery store, I spotted a beautiful bunch of daisies for $4.99, so I went against my no buy rule and purchased them for the centerpiece. I slipped them into a small olive bucket for a French Country feel. Instead of using a runner, I used a pretty faux fur round that I just love! It brings a lot of texture to the tablescape and is also just fun! You can see how I used this faux fur in my living room here. Of course, you can’t have Valentine’s Day without chocolate, right? 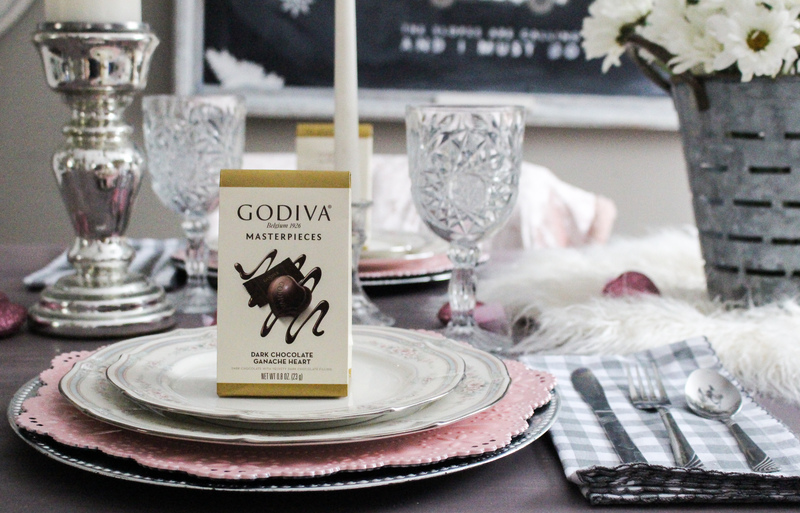 Each place setting holds a small bag of Godiva chocolates! Mercury glass candle holders and a few sparkly pink hearts complete the tablescape. 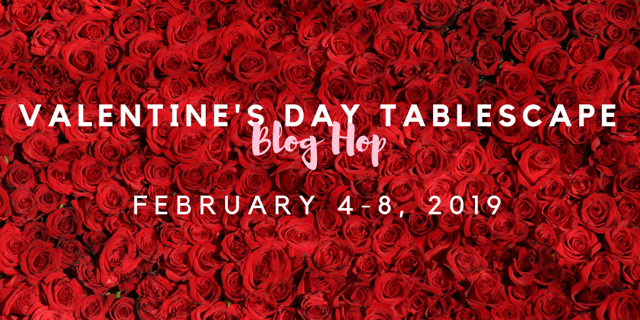 I hope you enjoyed this Valentine’s Day Tablescape and will visit the talented bloggers below to see their Valentine goodness! Gorgeous plate stack, Michelle! Love those little ice cubes too. 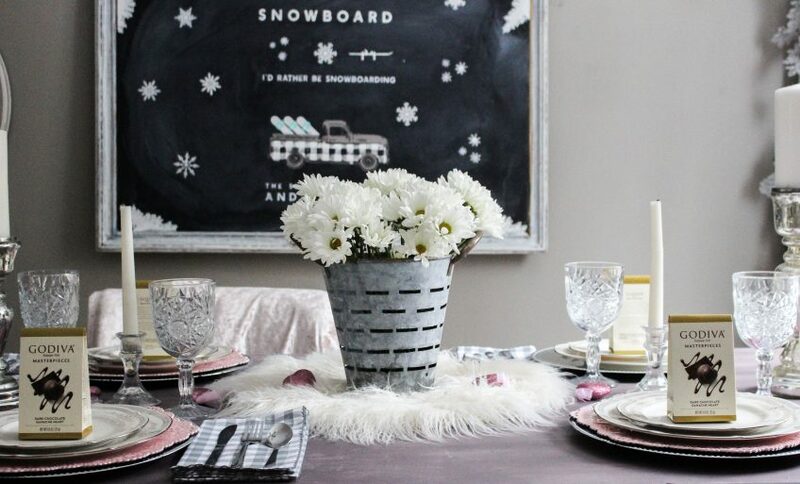 The subdued pink and gray is a good look for winter, and really works well with your decor! As for Marie Kondo, I’d like to invite her over and make her take some of my dish hoards home with her! She may be cute, but she spark a little anxiety in me, especially as I am currently working hard to do a serious purge. I don’t need that kind of background noise, lol! Michelle, I agree with Rita, it is a beautiful plate stack. Your wedding china is perfect for the holiday of love and romance. Pink and silver make a winning combination for Valentine’s Day. It is a pleasure to blog hop with you this week! I adore those chargers! It is fun to shop our own homes and use our treasures in a new way. I think that fresh flowers shouldn’t count against your ‘no new’ rule. Love the pink and silver mix. The flowers in the olive bucket are so cute. The pink chargers really set the tone and of course your beautiful china is a perfect choice for a romantic dining table. The ice shaped ice cubes are the perfect touch for the champagne! Cheers to a romantic Valentine’s Day! Pink, white, silver and grey. I love those combinations. Modern and yet soft and delicate. Your use of various textures like the faux fur contrasted with the galvanized steel is a very interesting one. Along with the shiny silver candleholders and the sparkle of pink heart scatters against the wood grain of your lovely table. A lovely mixture of things all around. Happy Valentine’s Day. You checked all the boxes for a soft romantic tablescape. I’ve passed up those lacy look chargers so many times and now I regret it. The faux fur base adds so much warmth to this beautiful table and I love the beverages you’ve shared. Michelle, your plate stack is perfect….as are your colors of soft gray and pink and white. 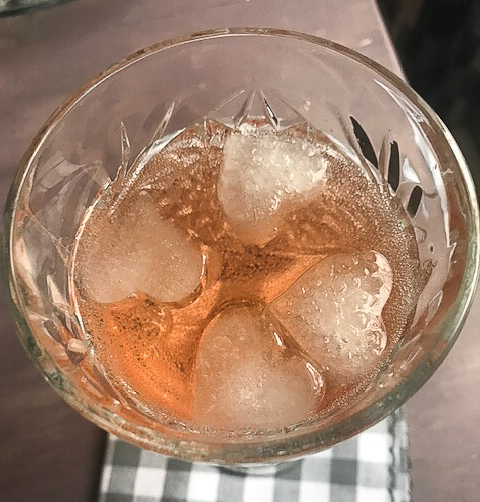 Your heart shaped ice cubes are also perfect for your champagne glasses. Kari @ Me and My Captain recently posted…All Things Valentine….And More! by the way, a pop up asking if I enjoyed this blog and would I share on social media would not leave the site… so I could not post more to my comment above ;( . Don’t know if it is a glitch or what., so I started over. Oh no! I thought i fixed that a long time ago. I hate glitches. I will take a look at it now. Thank you for letting me know. Michelle, I love your pretty tablescape. The chargers and your dishes go so well together. 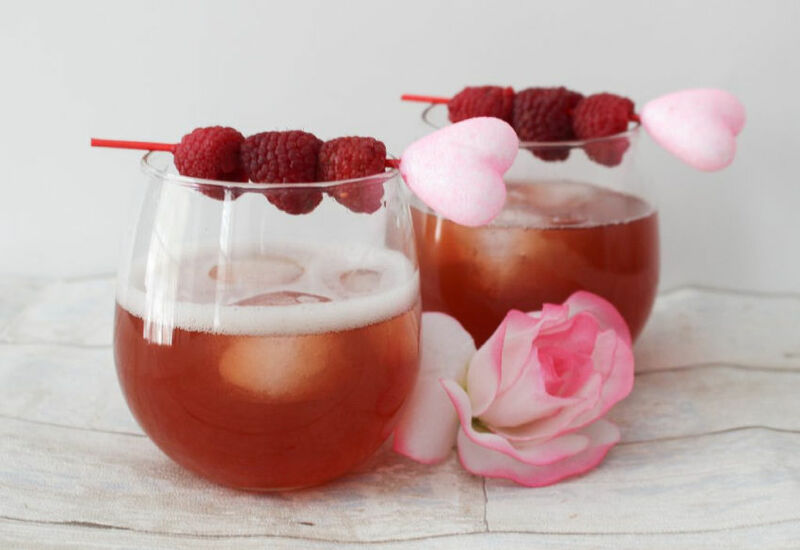 Love the idea of heart shaped ice cubes for the drinks. The old saying about great minds thinking alike might apply here. I posted a Valentine’s tablescape in pink and gray today and I also used what I already had. it’s great to shop your own home for seasonal decor. Michelle, what Rita said, gorgeous plate stack! 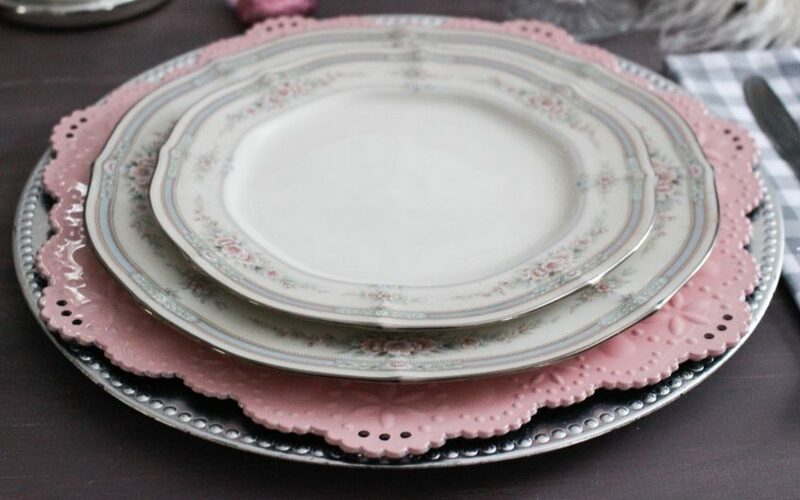 Your wedding china is lovely and how perfect to incorporate into this sweet Valentine’s table. I have been hearing some buzz about that show, and now I’m convinced to check it out. Just hope she doesn’t recommend getting rid of any tableware or keepsakes! When that time comes, I’m gonna need professional counseling for sure! Love those pink chargers Michelle, and your unique blend of elements really looks modern, yet vintage and romantic at the same time. Love the fun fur throw! I am so trying not to buy anything new, but flowers are always a must for me, and I did cave and buy some bunny plates the other day… Lovely table, Happy Valentine’s Day! Love the silver and pink, Michelle… those mercury glass candlesticks are so pretty! Michelle, those chargers are so cute. I have them too. I love the silver and pink. it is always fun to mix colors. How romantic to have the heart shaped ice cubes. Champagne is always a winner. A lovely table to enjoy a romantic evening. I love the silver and pink and how you were able to use what you had on hand! You are so creative and it came together beautifully! The chargers go so well with your lovely wedding china. The heart-shaped ice cubes are such an adorable touch! I definitely want to try your Raspberry cocktail. It looks amazing! Happy Valentine’s Day, my friend!! Michelle, love how your layered the dishes and that floral china is so pretty. The olive baskets are a great addition to the table and unexpected. Happy to be on the blog hop with you again. I really love your table, Michelle! The pink and silver are great together. When I looked at the first picture I thought the pink chargers were pink doilies. Those are just beautiful! 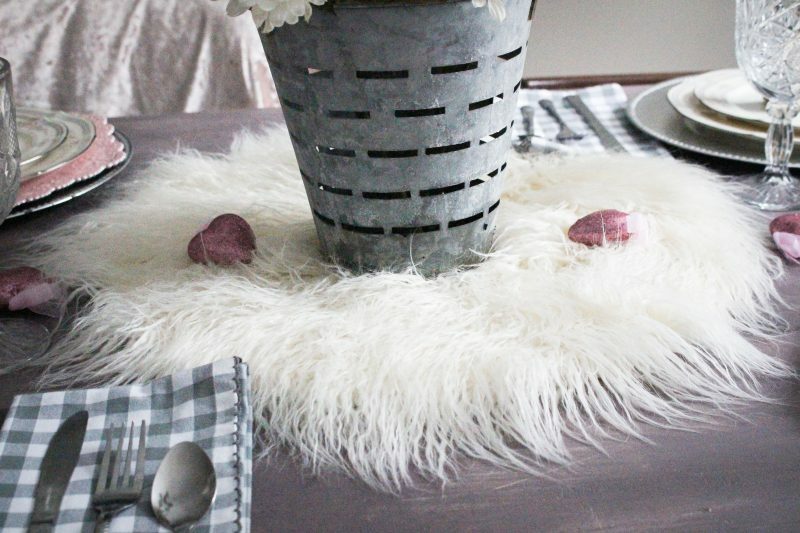 The faux fur as part of your centerpiece, is perfect! Thank you so much for sharing your table styling talents with us fo another blog hop! This tablescape reminds me of a vintage Valentine, complete with a doily! So pretty! I’ve also been konmarring my world and I’ve decided that since fresh flowers bring me joy, they don’t count as a purchase – just a replenish. Happy Valentine’s Day, Michelle! Michelle, the colors in your tablescape are stunning atop your farmhouse table…you were wise to omit a tablecloth. Of course, I love the buffalo check napkins! 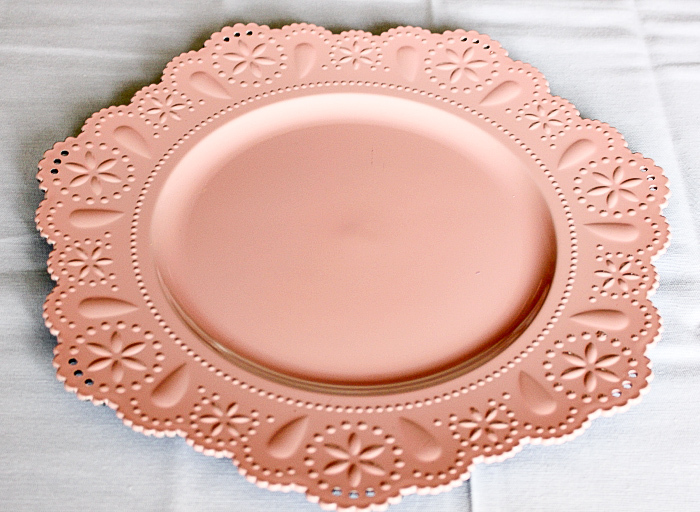 The plate stack with the pink “doily” plate and your wedding china is lovely. Also love the olive bucket and daisy centerpiece. It’s a pleasure hopping with you this week. Happy Valentine’s Day! You have set the cutest farmhouse chic Valentine’s Day tabl! I love the olive bucket with flowers as a centerpiece and the pretty plates and chargers you used. How nice to use your wedding china in a Valentine’s tablescape! The little heart ice cubes are a darling touch. So happy to hop with you this week. Have a Happy Valentine’s Day! 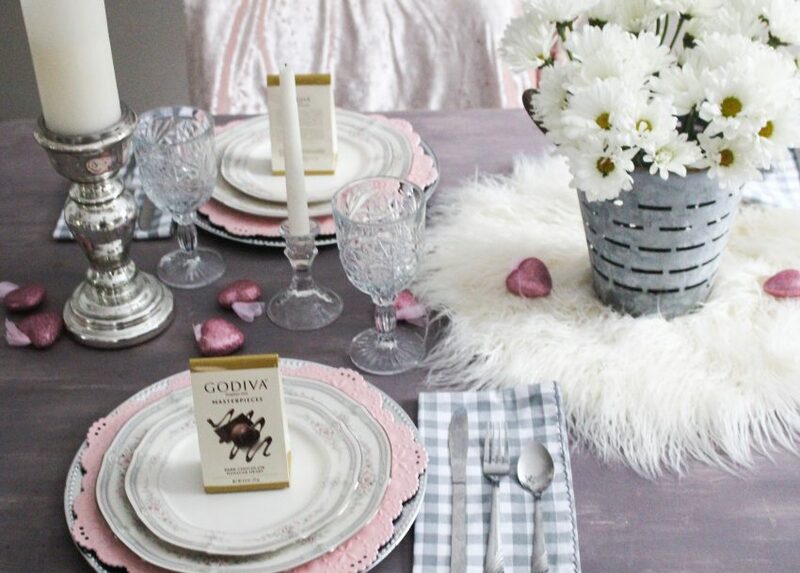 Pink and silver make such a pretty color combination on your table. I love your wedding china, and it looks so lovely paired with the pink charger plates. 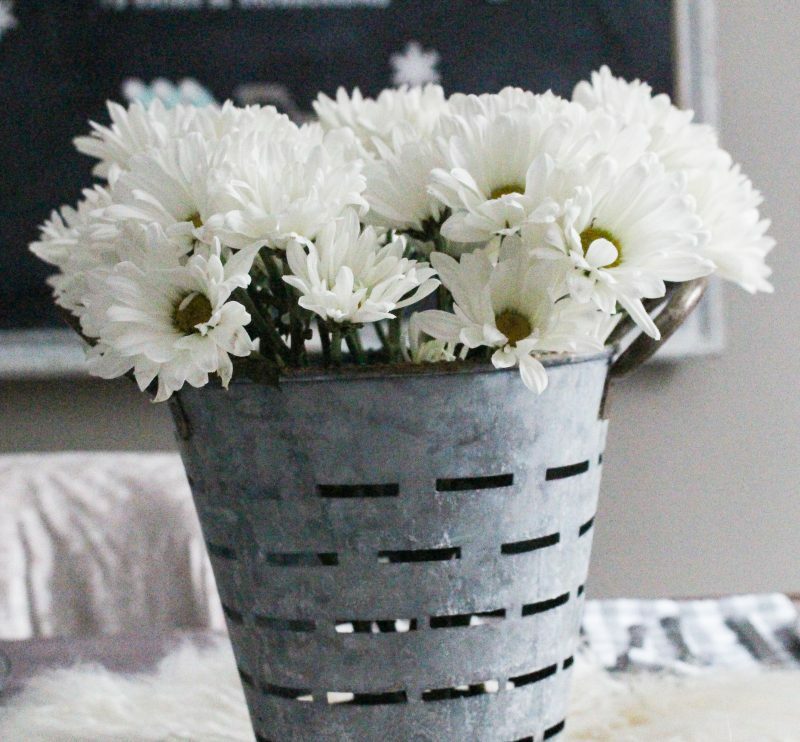 The pretty white daisies add the perfect finishing touch. It has been so much fun being on this hop with you! Happy Valentine’s Day!!! The color combination of pink and silver looks really really good. I love the table set up as well. Thanks for sharing.